I was on my way home when I saw a picture of the pierogi’s from The Saint Tavern; and, coincidentally my bus was on a short run and stopped just outside it. I took this opportunity to have an early dinner and catch the last of the Jays game. 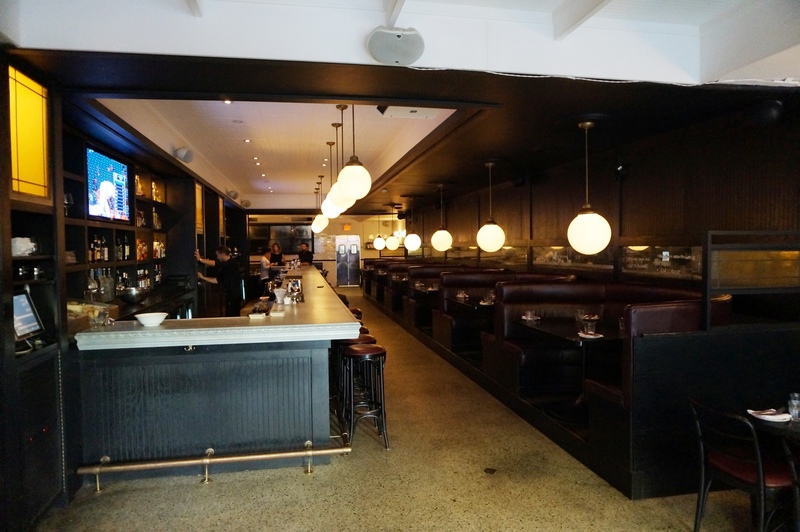 The Saint Tavern labels itself as a gastropub, it boasts a casual vibe with a sleek and upscale tavern like interior, dimly lit and housing rows of tables and elegant leather booths all while having a couple of TV’s to keep it’s pub like name. Onto the food, and their whole goddamn menu looks incredible; I knew I was getting the pierogi’s from the get go but the sheer choice of food made me question what else I should be eating; to name a few they had fried chicken, a bone marrow burger, duck nuggets; steak tartare and a whole bunch more. 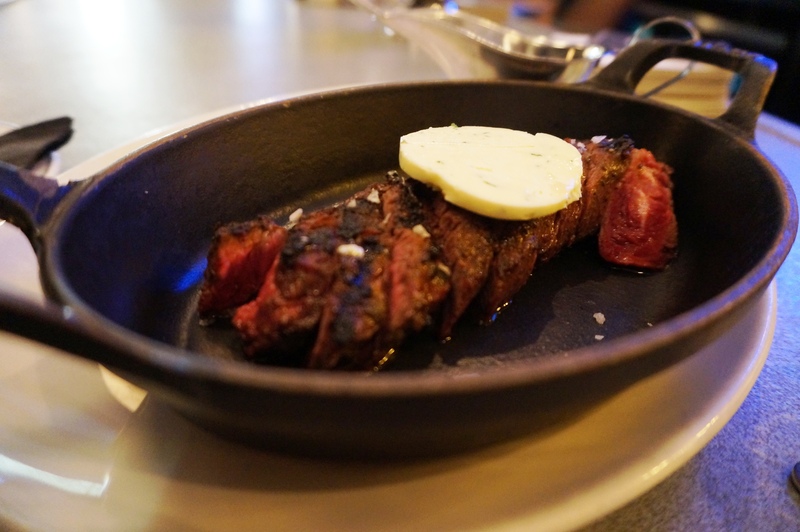 I ordered the pierogi’s and their hanger steak done rare, an 8oz piece served with thyme butter and nothing else. It was early so the bartender and I got to talking and he threw in a free oyster as well; the freshness and flavour of the mignonette was great and a really good way to start the meal. The food came out fairly promptly, I mean I was 1 of 4 people in the place that early, I started with the steak; a phenomenally charred and rare piece of grassfed beef, the hanger, known for being bolder in flavour while retaining a decent bite to it, was exactly that; a lovely meaty and beefy flavour profile with the tenderness being good for the cut. The smokiness and saltiness were both liberal but not excessive while the butter atop added a final layer of creaminess. It also came with their house sauce which I don’t believe was need nor too my liking. 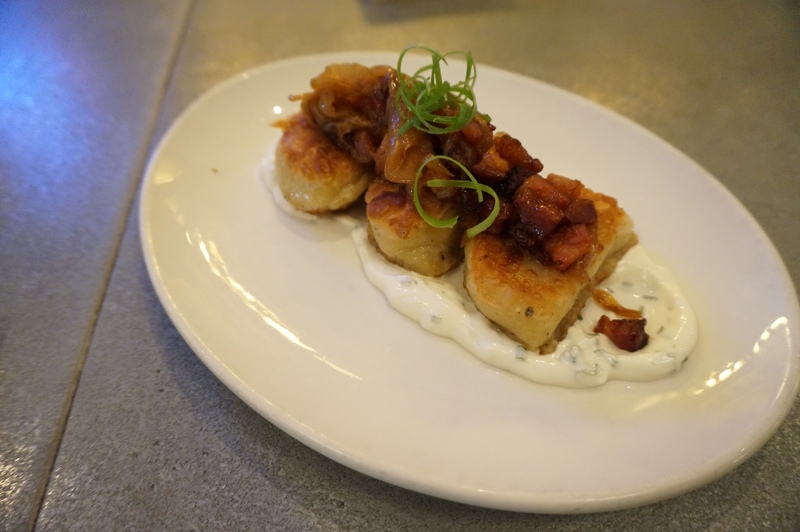 The pierogi’s were not only stuffed with cheese, cabbage and pork belly but also served with a herbed sour cream, caramelized onions and lardons. These were some next level pierogi’s, Thick cased multi ingredient fillies and grilled to perfection. The onions and lardons were exceptional on top; a hint of apple coming from the lardons making it pair so well with the richness of the dish. The waiter brought out some hot sauce for me to try with the pierogi’s, explaining to me it’s a butter based sauce, on it’s own I wasn’t its biggest fan but with the pierogi’s it was dynamite, a great tang to top off all the flavours present. 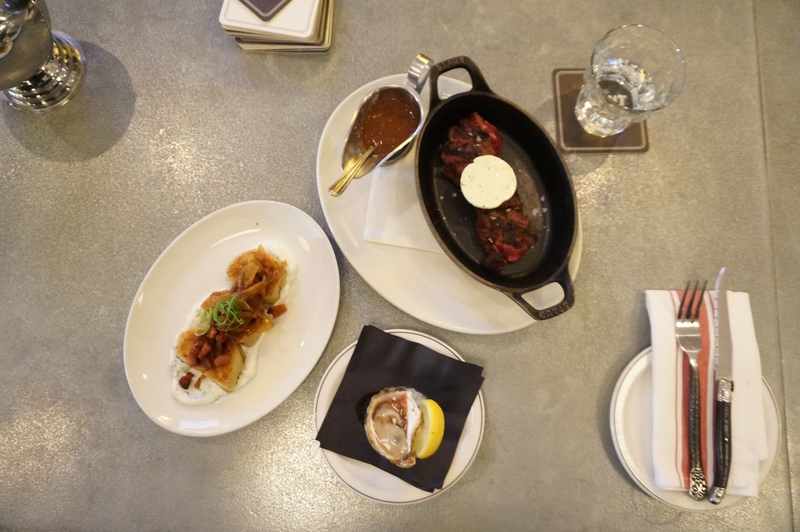 The Saint Tavern is definitely doing something special; a likable and inviting atmosphere with elegant, classic and affordable food, my whole dinner cost $34 before tip. I will be back and there will be an update to this post! 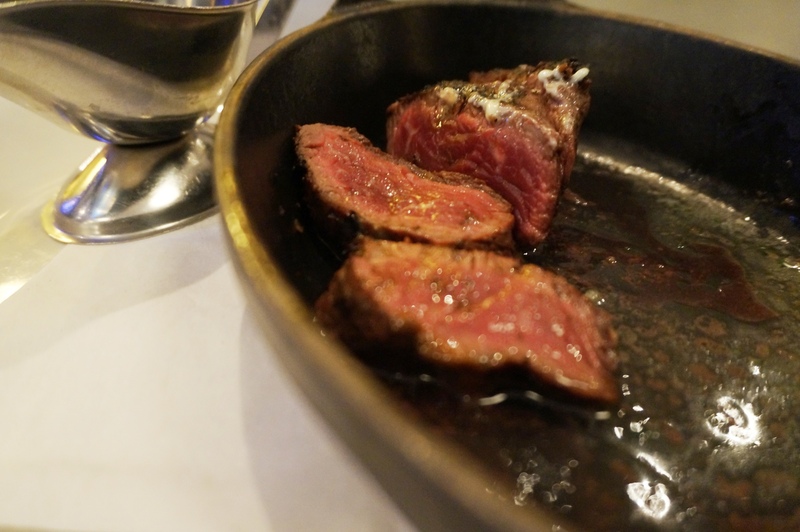 Posted on October 1, 2015 December 19, 2016 by AdrielPosted in Steak, TorontoTagged Hanger Steak, Pierogis, Steaks.